Seboeis Lake is a regional gem, treasured by enthusiasts of both motorized and non-motorized recreation. Lake-goers, local leaders, and businesses tied to tourism all have a stake in enhancing the Lake Seboeis experience: Especially in today’s challenging economy, land acquisition for recreation is a top priority for communities hoping to attract visitor dollars. In May 2012, The Trust for Public Land announced the conservation of more than 5,700 acres of land along the southern end of Seboeis Lake. The project brings protection of the lake’s shoreline to 99 percent of the 45-mile total and forms an anchor to Maine's largest contiguous block of conservation land—more than half a million acres. 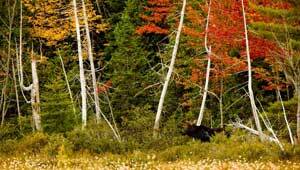 From this property, people can travel across protected land in all directions: along either side of the lake, through the Katahdin Forest project to the Nahmakanta Reserve, or through the 100 Mile Wilderness to Baxter State Park and the Allagash Wilderness Waterway. The latest addition joins two significant all-terrain-vehicle (ATV) corridors that previously ended north and south of the property. Linking together protected land also safeguards the ecological integrity of the entire Seboeis Lake region, with benefits for both water quality and wildlife habitat.